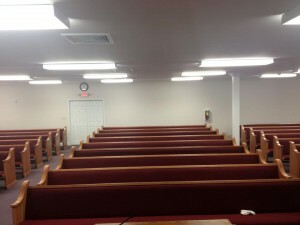 We recently wrapped up installing new church pews for the Torch Hill Road Church of Christ in Columbus, Georgia. They’re the closest church to Fort Benning in Columbus and serve a lot of military families as well as families who are part of the Columbus community. We installed 27 new church pews in their church, using a light stain and dark red fabric for the seats. This church is very simple in style, and the church pews we installed use a traditional design, perfect for a church looking to focus on the Word. The goal of Torch Hill Road Church of Christ is to learn the Word and grow in a manner that the Bible prescribes. 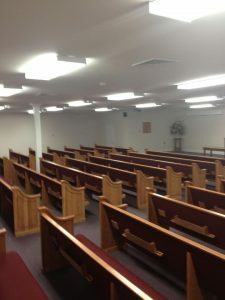 Their comfortable new pews will help enhance the experience of worshippers. Columbus, Georgia, is high on “Best Cities to Live in” lists, and it’s no wonder. With nearly 200,000 people, the city is situated on the Chattahoochee River and is home to museums and other cultural centers, as well as the longest urban whitewater course in the world. The city was incorporated in 1825, and was the site of the Haiman Sword Factory, which supplied broadswords during the Civil War. Today, there is an extensive military museum in Columbus, as well as an opera house, a symphony orchestra, and the Coca-Cola Space Science Center. Between the tourist attractions and nearby Ft. Benning, Columbus has a lot of visitors, and Torch Hill Road Church of Christ is very welcoming to travelers and newcomers. You’ll notice we also installed book racks, communion cup holders, and slots for donation cards or envelopes on the backs of all of the pews. If you’re looking for church pews with these options, keep in mind these come as a standard feature and not an add-on for all of our church pews. We were so pleased to serve the community at the Torch Hill Road Church of Christ. Following this installation, we got back on the road again, heading for the next church! 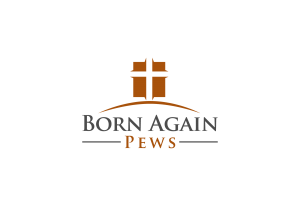 Born Again Pews builds, delivers, and installs beautiful, sturdy church pews for churches all across the nation. Are we coming to your town next?